Day 2 was our Golden Circle Tour. We waited for our pickup at the hotel patiently as they were running a little bit late. Once we were picked up we went straight to the bus depot where we transferred to a luxury coach liner. Iceland has the tour thing down where everything runs smoothly and is pretty comfortable. Our first stop on the tour was the Friðheimar greenhouse. Here we learned all about how farming is done locally in Iceland. If you have a chance, try the Friðheimar tomato soup which is made from the tomatoes grown on the premises. Iceland tries to grow their own food as much as possible so they don't have to import from other countries. We continued on to Gulfoss waterfall which looks triangular and is fed by the waters of Iceland's second largest glacier Langjökull. Throughout the ride on the side of the road we saw many horses. Icelandic horses are so special as they are pony sized and walk with five gaits. The second part of the Golden Circle tour is to visit the geysers. Strokkur Geysir and the geothermal pools were so stunning to look at. The colors were beautiful, steam came out of the ground, and water exploded into the sky. Waiting for Strokkur to explode. To conclude our Golden Circle Tour, we ended at Thingvellir National Park. Thingvellir National Park is where the American and Eurasian tectonic plates are separating from each other a little more each year. It was a center of parliament in the beginning, is a UNESCO World Heritage site, and most recently a backdrop for Game of Thrones. We took a trip to Iceland in February through an amazing package deal sold by IcelandAir. Weekend trips to Iceland were a bit of a trend with New Yorkers for a bit. We extended our trip by adding a few extra days to our vacation. We had high hopes of viewing the Northern Lights, looked forward to enjoying Valentines Day in Iceland, and couldn't wait to climb a glacier and experience The Blue Lagoon. It was time for some adventure and relaxation. Our trip began with going through JFK airport. We were greeted by many airport security, who when they saw that our boarding passes were for Iceland, gave us funny looks and joked with us that we were leaving cold New York City for an even colder place. Iceland does sound like a cold and remote country but the weather forecasted for that week was to be slightly warmer there than in New York. We'd see for ourselves soon enough. Our friends' trip to Iceland just a few weeks before us showed pictures of them in snow bundled up and with waterproof windbreakers to protect themselves from harsh rain. It was a breeze checking in and going through airport security. We arrived at the gate with plenty of time to spare. 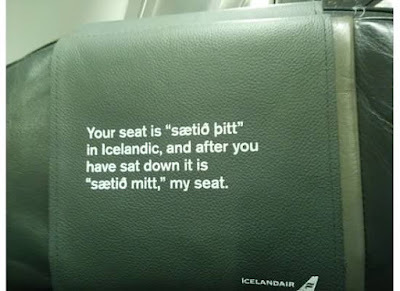 IcelandAir was such a nice airline to ride. The seats were spacious, the food was decent, and there were tvs with movies and television shows for each seat. Each seat also had an Icelandic greeting to teach you a few simple Icelandic words and cultural bits. We arrived at Keflavic airport after a five and a half hour flight. Keflavic was a really nice airport, very clean and modern looking. The bathrooms were high tech and each stall was its own private bathroom. I had booked our transportation to our hotel in Reykjavik with Flybus. Flybus was a luxury coach liner and the ride was about 45 minutes into the heart of Reykjavik. Everything went smoothly. I was just really surprised with the epic winds we met outside of the airport walking to the bus. The winds were so fierce that they would push you. We even saw a few suitcases escape from their owners and end up on the other side of the street. Hold on to your bus vouchers, luggage, and children if you have any! We did not have any specific plans for the first day except to get on a boat at night to go on a Northern Lights tour. We took advantage of the free time to see the city of Reykjavik. Our self guided walking tour included visiting Harpa, Sun Voyager, Hallgrimskirja, Perlan, and walking through town. I'll elaborate more on the Northern Lights in a separate post. Concert hall Harpa. I didn't get a chance to go inside because it was so early but the building itself was really nice to walk around. The lights on the outside change colors ever few seconds. Here you will smell the sulfur off of the water. Yay for rotten eggs. This is the path we followed along the water to see many of the sights. Sun Voyager sculpture by Jón Gunnar Árnason. This boat was massive and looked different depending on the lighting. Take many pictures. They will all be beautiful! The colorful houses of Reykjavik. We went to the top of Hallgrimskirja church. It costs 700 kr to go up, roughly $7 USD. We saw Perlan in the distance from the top of Hallgrimskirja. It looked close enough to walk to. Bad idea. The route was not direct and the hill to climb to it was slippery from the ice and snow. We took this picture on the roof of Perlan. We chose not to go to the Saga Museum or eat at the restaurant.